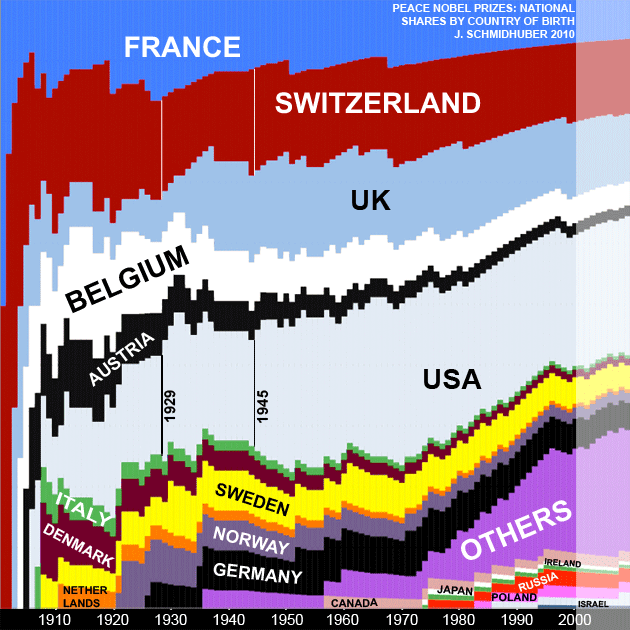 Figure 10: Peace Nobel Prizes 1901-2009: Evolution of cumulative national shares by country of birth (or home of organization) at the time of the award. The vertical width of a nation's colored band at each year measures its percentage of all Peace Prizes up to that year (image height = 100%). Here the differences to the citizenship-based ranking are minor. France and Switzerland shared the lead in 1901, Switzerland then led alone until 1909 (when it shared the lead with France and Belgium), then led alone until 1913, then again shared the lead with Belgium until 1917, then led alone until 1925, then shared the lead with the US until 1929 (since 1927 also with the UK). Since 1929 the US has led alone, except for 1944-1945 when Switzerland briefly caught up again. From Evolution of National Nobel Prize Shares in the 20th Century, Jürgen Schmidhuber, 2010. PDF. HTML.